This deep optical image of the Antennae galaxies (main image) shows new tidal debris at the northern tip (inset). PASADENA, CALIF. ? Cosmic debris stripped away fromthe wreck of colliding galaxies has been found by the Subaru telescope atop Mauna Kea, Hawaii. 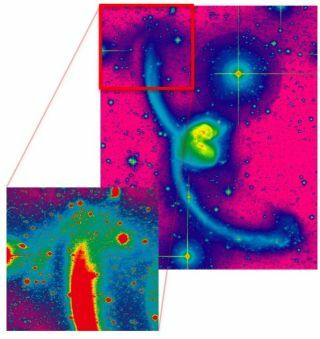 The debrisfields could shed light on galaxy formation and starburst activity in the earlyuniverse by allowing astronomers to retrace the paths of the collidinggalaxies before they merged. "Thisis equivalent to finally being able to trace the skid marks on the road wheninvestigating a car wreck," said team member Nick Scoville of theCalifornia Institute of Technology. The extentof the debris, some of which stretched over an area a few times larger than theMilky Way, hadn't been seen in earlier images of these collisions, astronomerssaid. A large extension of the Antennae was found to be twice the sizepreviously thought, and a new tidal tail was found trailing from Mrk 231. "Wedid not expect such enormous debris fields around these famous objects,"said team member Jin Koda of Stony Brook University in New York. Thediscoveries were announced here today at the 214th meeting of the AmericanAstronomical Society. Collidinggalaxies eventually merge and become a single galaxy. Our own Milky Way is fatedto collide and merge with the neighboring Andromeda galaxy in about 5billion years. The mutualtug the galaxies exert on each other can pull pieces of each galaxy out indifferent shapes. One exampleis so-called "tidal tails," which indicate a quick galactic merger.When galaxies come together quickly, they could trigger starburst activity inUltra Luminous Infrared Galaxies (ULIRGs). "Arp220 is the most famous ULIRG," said team member Yoshiaki Taniguchi of Ehime University in Japan. "ULIRGs are very likely the dominant mode of cosmic starformation in the early Universe, and Arp 220 is the key object to understandstarburst activities in ULIRGs."